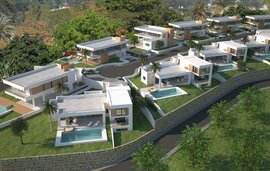 This modern luxury villa has absolutely everything that you could possibly need for modern living, a great location, top end finishes and superb views. This contemporary property has been beautifully designed and has been finished to the highest standards. The villa is set around a dynamic open plan living space, having large windows to allow the light to flood in and high ceilings. There are various terraces and from the solarium you have panoramic views of the Mediterranean sea and mountain views of La Concha. You have views of the beautiful landscaped gardens from every single room. The main entrance offers an impressive double height living room with cosy fireplace and direct access to the fabulous state-ofthe art kitchen and dining room. Also on the ground floor there is a guest bedroom with ensuite bathroom. Out in the superb garden there is an outdoor kitchen and bar, with plenty of areas for al fresco dining, relaxing and sunbathing by the heated salt-water pool with electric pool cover. On the upper floor of this spectacular villa, you have the magnificent master bedroom with a stunning bathroom and walk in closet, it has its own terrace and access to the roof top terrace. Also on this floor there are two more ensuite guest bedrooms with private terraces. As you would expect there is a lift that services all 3 floors. The lower floor is where you have a further 3 bedrooms and 3 bathrooms and due to the natural light from the patios, skylight and the feature window in the pool this level is also light and airy. The cinema, games room with billiard table and large independent laundry area are also on this level. The villa is exquisitely furnished throughout and other features include an alarm system, air conditioning, a domotic system, under floor heating, electric blinds and international tv channels. There is outdoor parking for 3-4 cars. 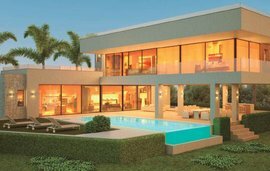 This simply fabulous contemporary villa is located in a quiet residential area, close to amenities, restaurants and the famous Puerto Banus. It would be an ideal place to live all year round but you could also use it as a holiday home or it could be rented out for an incredibly high rental yield.